Our next runner-up is Alolan Exeggutor-GX (SM: Crimson Invasion 74/111, 107/111, 118/111). I’m still super short on time, so I won’t be going into my usual level of detail, but I’ll still give you a good idea of what I think about this card and why. Being a Dragon-Type isn’t worth much in Standard, but in Expanded, you’ve got Double Dragon Energy for speed and flexibility. Being a Pokémon-GX means you get a few extra goodies alongside a few extra hassles; a fairly neutral trait too often mistaken for a major bonus or crippling penalty by the new or inexperienced. Being a Stage 1 seems to be the second best Stage of Evolution; not as streamlined, but with plenty of options. 220 HP has a good chance of surviving a hit outside of Weakness, but unfortunately that Fairy Weakness is very relevant right now (mostly due to Gardevoir-GX). No Resistance is the worst, but also the most common. A Retreat Cost of three means planning around it, in the negative sense. Alolan Exeggutor-GX has three attacks. “Tropical Head” costs [G] and allows Alolan Exeggutor-GX to do 20 damage per Energy attached to itself to one of your opponent’s Benched Pokémon. “Dragon Hammer” needs [GCCC] to hit the opponent’s Active with 120 damage and Confusion. “Tower-Go-Round-GX” also needs [GCCC], this time to do 180 damage plus the option of rearranging the Energy you have attached to your Pokémon. Tropical Head looks fast but is actually the slowest attack on the card; it takes too much Energy to OHKO even smaller Bench-sitters. Dragon Hammer is useful filler; 120 for four is adequate when its mostly Colorless, and the Confusion is a small bonus. Unfortunately, it’s also an unreliable bonus, both due to the coin flip and how easy it is to shake Special Conditions. Tower-Go-Round is good, providing a fairly big hit with the chance to move around any or all of your Energy in play; great if you know Alolan Exeggutor-GX is about to be KO’d. The attacks do have synergy with each other, it feels like Tropical Head was supposed to be deadly, and it isn’t. Because it isn’t, Dragon Head is only there to back up a one-and-done GX-attack, which means it falls short as well. Tower-Go-Round-GX is the best attack on the card, but as a one-time deal with mediocre and/or niche fallback options, it can’t justify the line. Even in Expanded, where a deck may already be maxing out Exeggcutor (BW: Plasma Freeze 4/116; BW: Plasma Blast 102/101), Alolan Exeggutor-GX doesn’t do enough to justify its inclusion. I can’t think of anything that can quickly attach enough Energy that doesn’t already have better options. The only place to really enjoy this card seems to be the Limited Format, where everything about performs better… because its Limited, and people can’t reliably use all those cards that are so much better in Constructed Format play. 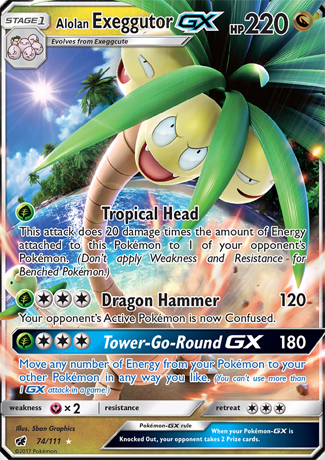 Nevertheless, Alolan Exeggutor-GX impressed one reviewer enough to take fifth place on an individual list, garnering six voting points. That actually tied with tomorrow’s card, but of the two lists that went beyond a top 10 had Alolan Exeggcutor-GX as that person’s 17th place pick, which broke the tie. Alolan Exeggutor-GX didn’t make either my top 10 or my top 15; we’ll find out if they saw something I missed. Apparently, having a long neck and a long tail can give so much creativity to the developers of the Pokémon TCG. But has their creativity paid off? Alolan Exeggutor-GX swung by with its massive 220 HP for a Stage 1 Pokémon-GX, which should have been impressive but thanks to this set, not so much anymore. Being a Dragon type, it is weak to Fairy, which might just be the worst weakness to have right now if the new Metal/Steel type attackers didn’t do its job effectively to curb the dominance of Gardevoir-GX. Speaking of Dragon types, it is also the first Dragon Pokémon card to not have more than one colored energy typing. This one only needs Grass and Colorless to fuel its attacks, as opposed to say, Kommo-O GX who needs Lightning, Fighting and Colorless energies, so at least it can be a Dragon type attacker for Grass decks. Not that it can hit anything for Weakness anyway (at least in the Standard format), but it can help against the Fire weakness that Grass decks usually share. Alolan Exeggutor-GX’s attacks however, doesn’t seem to help players cement what does it excels in, as its first attack’s orientation is different than its two other attacks. Tropical Head costs 1 Grass energy and it deals 20x the number of energies attached to Alolan Exeggutor to any opposing Pokémon. Granted that you can accelerate energy fast enough, or you use something like a Venusaur (SM SHG)’s Jungle Totem to double energy counts, it can start putting pressure on opposing evolving basics, such as Ralts, Beldum, Wimpod, Trubbish and Grubbin, by knocking them out cold before they evolve, thinking they are safe in the bench. But the other two attacks does suggest that Alolan Exeggutor-GX is best used as a offensive pressurer with team support orientations. Both its other two attacks costs at least 1 Grass and 3 Colorless energies, so realistically Tropical Head will do 80 damage when the other attacks are fully setup. Dragon Hammer does 120 (150 with a Choice Band) to the Active and it confuses them, giving them a 50% chance to successfully attack and another 50% to deal 30 damage to itself. As we seen in Espeon-GX (SM Base Set), confusion-based attacks are great amazing, and I think 120 is a decent number as it is exactly 4 times the damage Psybeam does, but it needs 4x the time to setup. Maybe as a mid game defensive method this is fine, but 120 plus an extra 30 on a coin flip is a bit mediocre, especially as you need 4 energies to use it. Tower-Go-Round GX deals 180 damage (210 with a Choice Band) for a similar energy cost and allows you to move energies from all over your Pokémon. I can see this attack being best used in the mid game, where the energies are spread all over your Pokémon, distributing them to a Pokémon that needed them the most, or when Alolan Exeggutor is about to be knocked out next turn and you move all the energies from Alolan Exeggutor-GX to your other Pokémon. It can work that way. In the Expanded format we do have the XY Ancient Origins Eeveelutions which can give an extra Water, Lighting or Fire typing depending on the Eeveelution to help Alolan Exeggutor-GX strike for Weakness, which may come in handy as it is a Stage 1 Pokémon, but again, only in Expanded. However, alongside being stuck to a format where Fairy decks rule, Alolan Exeggutor-GX also faces some… meta problems. Dragons are already weak in this metagame with it unable to hit Weakness against anything, and so the best it could do is to get extremely high damage attacks spammed reliably or be a very, very good support. Alolan Exeggutor-GX is not either of those. Its main attack, Dragon Hammer doesn’t deal much even with the confusion, Tropical Head needs over 3000 years to power up and Tower-Go-Round GX doesn’t deal as much damage as I’d like it to. 180 simply didn’t cut it in the power creep of 2017. If it deals 200 flat out, then it might be more respectable, as with a Choice Band it can deal 230 and a straight one shot on Gardevoir-GX once. But since it doesn’t, it’s hard for it to have any sort of grip in the meta, but you can’t deny its early game pressuring power with Tropical Head and a close up with Dragon Hammer. I think Alolan Exeggutor-GX has potential and it just needs the right partner or the right meta situation.